Quentin Tarantino: now there is a name which brings expectant smile to this mug. Like the rest of the world, I sat in amazed delight in 1994 watching the very original cinematic opus called Pulp Fiction. Talk about different. Talk about shaking up the status quo. Love it or leave it, that film showed the talent of an individual who was stepping to the beat of a different drummer. As Rotten Tomatoes so accurately summed it up: "One of the most influential films of the 1990s, Pulp Fiction is a delirious post-modern mix of neo-noir thrills, pitch-black humor, and pop-culture touchstones." Gee, with the buzz about this man, how could I not want to see anything else he would do? 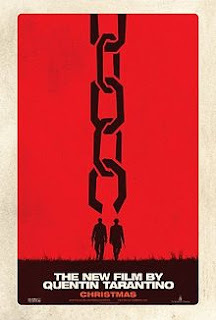 On Christmas day 2012 (IMDb: release dates by country), we will all have the opportunity to see Mr. Tarantino's latest endeavour, Django Unchained, a western apparently inspired by the 1960s spaghetti western Django. Starring Jamie Foxx, Leonardo DiCaprio and Christoph Waltz, the film is set in the Deep South and follows Django, a slave (Foxx) freed by Dr. King Schultz (Waltz), a bounty hunter, in return for his assistance in hunting down and killing some ruthless bad guys. Christoph Waltz is a name worth remembering as it was this gentleman who played the absolutely fabulous part of SS-Standartenführer Hans Landa in Tarantino's 2009 film Inglourious Basterds. Just to further whet your appetite, the cast also includes such notables as Kerry Washington, Don Johnson, Bruce Dern, Jonah Hill and Samuel L. Jackson. I add that Franco Nero, the star of the 1966 Italian western Django, will also make an appearance. I've collected some information about the Tarantino filmography. If nothing else, it does underline a fairly impressive level of quality in his work. Even Death Proof of the Grindhouse double feature while a financial failure, did achieve some critical acclaim. That is to say that even at his worst, Quentin is better than a lot of filmmakers. I saw this movie when it first came out in 1994 and found it one of the most entertaining and original films I had seen in a long time. Amusingly enough, I knew the MF word but probably heard it more times over the film's running time of 154 minutes than I had in my entire life. Ha ha. At some point, I was extolling the virtues of Pulp Fiction to a married couple but for some inexplicably reason failed to mention this was adult entertainment. No, I mean really adult entertainment. They later told me they rented the movie and sat down with the entire family to watch my highly recommended suggestion. This couple at the time had children aged 6, 8 and 10. Oh boy, do you see the storm brewing on the horizon? I forget how many minutes exactly you get into the film before Samuel L. Jackson starts with a stream of profanities that would strip the chrome off of metal and cause little old ladies faint dead away within a radius of 100 feet (30m). My friend said he jumped up and ripped the video cassette out of the player and nobody has ever seen the rest of the film. Let me summarize my oversight in explaining the film and its adult contents by saying, "Oops!" I know where I'm going to be on December 25, 2012. My celebration of the birth of baby Jesus will have an R rating. It may be blasphemous but take that MFs! Django Unchained is an upcoming western film written and directed by Quentin Tarantino. The film stars Jamie Foxx, Leonardo DiCaprio, and Christoph Waltz, and is scheduled to be released on December 25, 2012. Django is a 1966 Italian spaghetti Western film directed by Sergio Corbucci and starring Franco Nero in the eponymous role. The film earned a reputation as being one of the most violent films ever made up to that point and was subsequently refused a certificate in Britain until 1993, when it was eventually issued an 18 certificate. Subsequent to this the film was downgraded to a 15 certificate in 2004. Quentin Jerome Tarantino (born March 27, 1963) is an American film director, screenwriter, producer, cinematographer and actor. He has received many industry awards, including an Academy Award, a Golden Globe Award, a BAFTA and the Palme d'Or and had been nominated for an Emmy and Grammy.